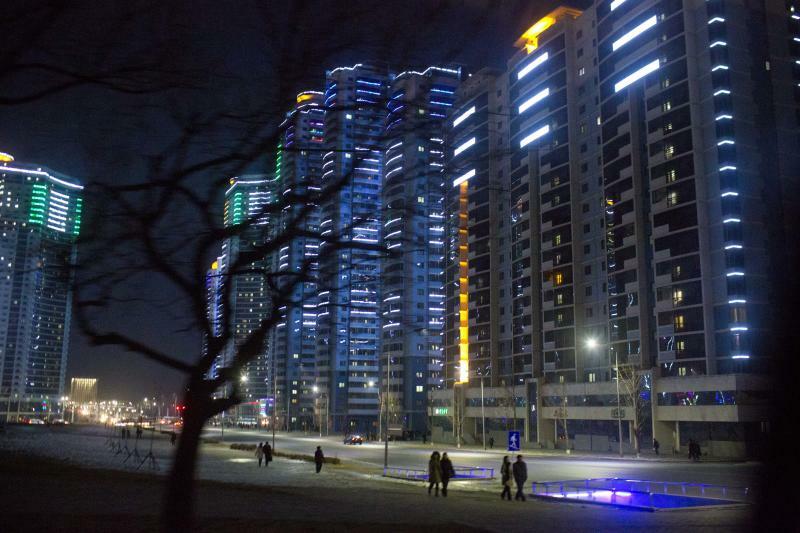 PYONGYANG, North Korea (AP) — The heart of this city, once famous for its Dickensian darkness, now pulsates with neon. Glossy new construction downtown has altered the Pyongyang skyline. Inside supermarkets where shopgirls wear faux French designer labels, people with money can buy Italian wine, Swiss chocolates, kiwifruit imported from New Zealand and fresh-baked croissants. They can get facials, lie in tanning booths, play a round of mini golf or sip cappuccinos. Nearly 2 million people are using cell phones. Computer shops can't keep up with demand for North Korea's locally distributed tablet computer, popularly known here as "iPads." A shiny new cancer institute features a $900,000 X-ray machine imported from Europe. Pyongyang has long been a city apart from the rest of North Korea, the showcase capital dubbed a "socialist fairyland" by state media. But a year after new leader Kim Jong Un promised publicly to bring an end to the "era of belt-tightening" and economic hardship in North Korea, the gap between the haves and have-nots so far has only grown with Pyongyang's transformation. Beyond the paved main streets of the capital, life remains grindingly tough. Food is rationed, electricity is a precious commodity and people get around by walking, cycling or hopping into the backs of trucks. Most homes lack running water or plumbing. Health care is free, but aid workers say medicine is in short supply. For decades, North Korea seemed a country trapped in time. Rickety streetcars shuddered past concrete-block apartment buildings with broken window panes, chipping pastel paint and crumbling front steps. 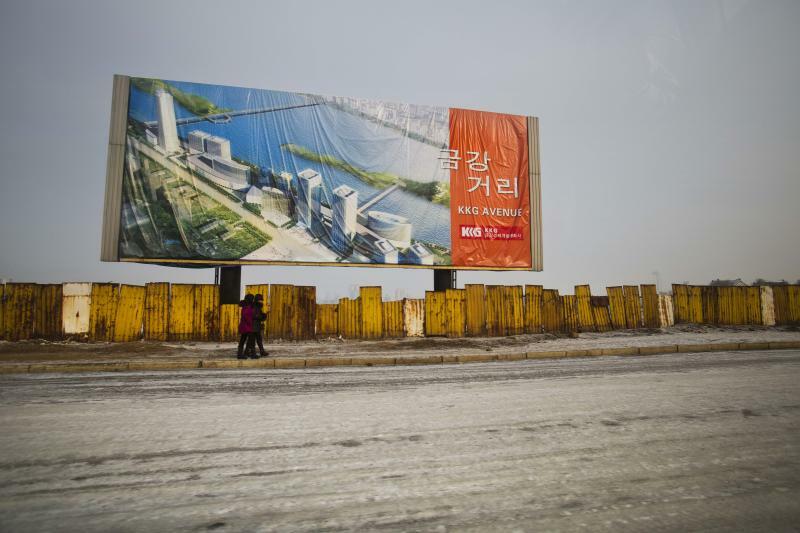 But since 2010, as part of the campaign to build a new city for their new leader, Pyongyang has been under construction. Scaffolding covers the fronts of scores of buildings across the city. Red banners painted with slogan "At a breath" — implying breakneck work at a breathless pace — flutter from the skeletons of skyscrapers built by soldiers. Often, the soldiers are scrawny conscripts in thin canvas sneakers piling bricks onto stretchers or hauling them by hand. In 2011, they set up temporary work camps along the Taedong River, makeshift shantytowns decorated by red flags. Their work focused on downtown Changjon Street, where ramshackle cottages were torn down to make way for department stores, restaurants and high-rise apartments. Today, the street would not look out of place in Seoul or Shanghai. Indeed, many of the goods — Hershey's Kisses, Coca-Cola and Doritos — on sale at the new supermarket were imported from China and Singapore. "What is a 'delicatessen'?" a North Korean asked as a butcher in a white chef's hat sliced tuna for takeaway sashimi beneath a deli sign written in English. Upstairs, baristas were serving Italian espressos, bakers were churning out baguettes and white wedding cakes. One new Changjon Street resident, Mun Kang Sun, gave The Associated Press a tour of the apartment she and her husband were granted in recognition for her work at the Kim Jong Suk Textile Factory. A framed wedding portrait hangs on the wall above their Western-style bed. There's a washing machine in the bathroom, an IBM computer in the study and a 42-inch widescreen TV. AP was not allowed to visit other apartments to compare whether the furnishings are typical for Pyongyang residents. Orphaned as a child, Mun said she began working in factories at age 16. She earned the title "hero of the republic" after exceeding her work quota by 200 percent for 13 years. She says she accomplished that by dashing around the factory floor operating four or five machines at once. "When we heard the news that we'd get a nest where we can rest, and we got the key for our apartment and took a look around, we were totally shocked because the house is so nice," said her husband, Kim Hyok. "It's still hard to believe this is my home; it still feels like we're living in a hotel." Though the apartment has faucets, old habits die hard. The bathtub was still filled with water, a bucket bobbing in the tub, as in countless homes across the country where water is pumped from a well, carried in by hand and used sparingly. Elsewhere in the city, aging buildings are getting upgraded. But most are still drafty, the walls poorly insulated, even in the capital. Elevators and heat are rare. North Koreans are accustomed to wearing winter jackets and thermal underwear indoors from October to April. Power cuts have been less frequent in Pyongyang since the opening of a hydroelectric power station to the northwest, but it's still common for the lights to go out in the middle of dinner. Most people just carry on drinking and eating. Outside Pyongyang, nightfall comes early. In Ryonggang, west of the capital, lights were out as soon as the sun set. At one inn, two women stood chatting quietly in a lobby lit with a candle as a shrill voice from a radio broadcast chortled from loudspeakers nearby. Kim Jong Jin's farm cottage in Hamhung has a generator, allowing him and his wife to watch DVDs at night on a TV they carefully cover during the day with a frilly lace veil. Their thimble of a home is simple but spotless, the papered floors clean enough to eat from. Water is piped into a well in the kitchen. Heat comes from the traditional Korean "ondol" system of feeding an underground furnace with wood. Waste is turned into methane gas for cooking. Food for the household comes from the garden outside. But not everyone lives in such relative comfort as the Kims, whose home government officials are willing to show off. There are stark signs of poverty across the country. A mother huddles over a child as she sits shivering by the side of the road. Barefoot boys in a village destroyed by floods scamper about dressed in little more than underwear. Sharp shoulders and splotchy faces betray the gnawing hunger of young soldiers. Beyond the paved, pocked highways that radiate from Pyongyang, there are few roads between the denuded mountains, just dirt paths that become dangerously muddy with rainfall and treacherously slippery in winter. Villagers struggle to clear snow with makeshift shovels crafted out of planks of wood. Private cars are a rarity outside the capital, and gasoline is scarce. In Hamhung, North Korea's second-largest city, soldiers cram into the backs of trucks powered by wood-burning stoves that send smoke billowing behind them. Goods are strapped to the back of bicycles, from firewood to dead pigs. Old men sit crouched by the side of the road with bike pumps, offering to fix flats. Oxen, and people, plod past pulling carts. The closest most may get to the capital in their lifetime is by seeing it on state TV. For them, Pyongyang would truly seem like a fairyland. Life in the North Korean countryside would be familiar to South Koreans old enough to recall the poverty in their nation just after the Korean War. Indeed, into the 1970s, North Korea was the richer of the two Koreas. Today, newly affluent South Korea has the world's 15th-largest economy. In North Korea, meanwhile, two-thirds of people struggle to find their daily meal, according to the World Food Program. North Koreans acknowledge the devastating economic loss of the Soviet safety net in the early 1990s. But they blame the county's growing international isolation on the U.S., its Korean War foe, which has led efforts to punish North Korea for developing its nuclear weapons program. Pyongyang instead has turned to fledgling trade with companies in China, Singapore, Indonesia, Italy, Egypt and elsewhere. These joint ventures keep the shelves in the capital stocked with goods, computer labs filled with PCs, streets crowded with VWs, in spite of sanctions. For years, foreign goods and customs were regarded with practiced suspicion, even as they were secretly coveted. Kim Jong Un has addressed that curiosity by encouraging trade and by quoting his father in saying North Korea is "looking out onto the world" — a country that must become familiar with international customs even if it continues to prefer its own. Kim has not made it significantly easier for North Koreans to travel, channel surf or read travelogues posted online, but he is arranging to bring the Eiffel Tower and Big Ben to them in the form of a miniature world park slated to open later this year. The flow of cash and goods has created a burgeoning middle class in the capital. Pyongyang now has a parade of fashionistas in eye-popping belted jackets, sparkly barrettes clipped to their hair, fingernails painted with a clear gloss. At one European-style restaurant last week, a young couple on a date sipped cocktails topped off with Maraschino cherries and feasted on pizza, their cellphones laid on the table. At one beauty salon, the rage is for short cuts made popular by singers from the all-girl military Moranbong band who have jazzed up North Korea's staid performance scene with their bobbed hair, little black dresses and electric guitars. "There are so many young women asking to get their hair done like them," hairstylist Chae Cho Yong said. While the differences between the showcase capital and the hardscrabble countryside are growing starker, one thing remains the same: the authoritarian rule and the intricate web of laws governing life in the Stalinist state. Even as they laugh, North Koreans calibrate their words. Criticism of the state and leadership is not only taboo but dangerous; when asked for their opinion, most people parrot phrases they've heard in state media, still the safest way to answer questions in a country where state security remains tight and terrifying. Very few have access to the Internet, cable TV, international phone lines. It's still illegal for them to interact without permission with foreigners, who are kept on a tight leash and discouraged from making impromptu visits to homes, shops, restaurants and offices. Around Chae, the cavernous barber shop was empty, not a single customer in the brand new swivel seats. An employee explained that most North Koreans are at weekly ideology study sessions on Saturdays, the only day of the week foreigners are allowed inside. 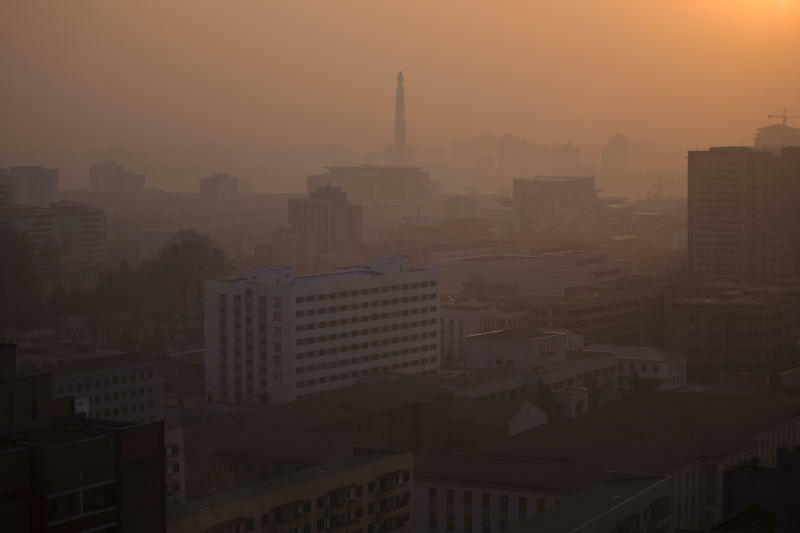 Follow AP's bureau chief for Pyongyang and Seoul at www.twitter.com/newsjean.